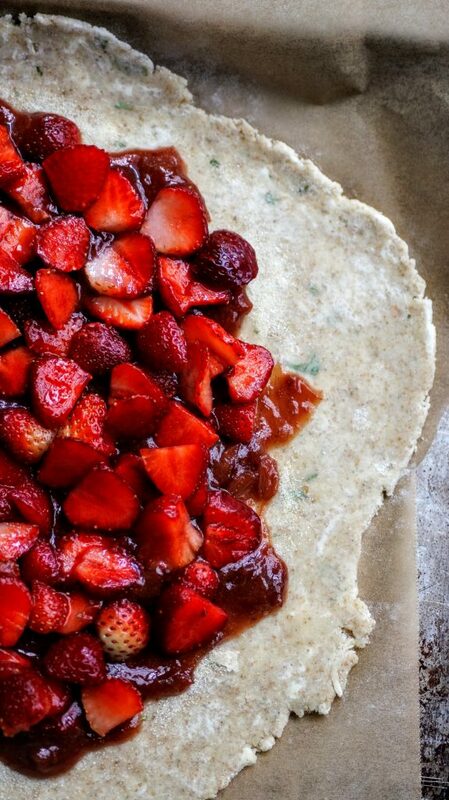 Perfect seasonal strawberries make this galette perfect all summer long. I love pie just as much as the next person, but sometimes I don’t have the patience to make the perfect lattice or cut outs for my pie. Sometimes I just want to enjoy the benefits of pie without all the fuss and muss. Don’t get me wrong, I LOVE gorgeous lattice work and beautiful cutouts, but they also take a ton of time and patience. Enter pie’s cousin, the galette. Just as tasty as pie with half the work, effort and stress. It’s pie’s younger, more hip cousin, a little less formal but packs just as much punch and flavor. I could make 4 galettes in the time it would take me to form one perfect pie, SERIOUSLY! 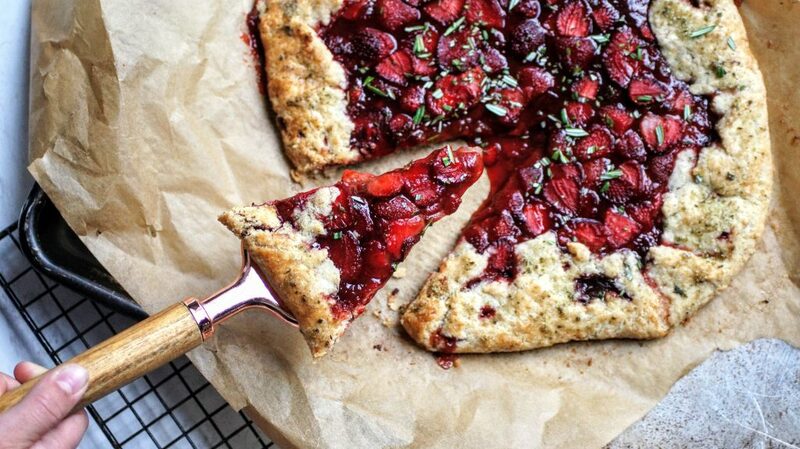 So this Memorial Day or summer gathering, treat your friends to this delectable strawberry galette bursting with flavor and savory hints of rosemary. A savory crust sprinkled with Jacobsen’s Rosemary Salt balances the sweetness to make this an unbelievable flavor profile. I’ll keep this short and sweet and give you even more time to skip ahead to the recipe and work on that perfect galette this holiday weekend! Semolina and sugar mixture spread on rosemary crust. This layer helps absorb some of the strawberry juice. 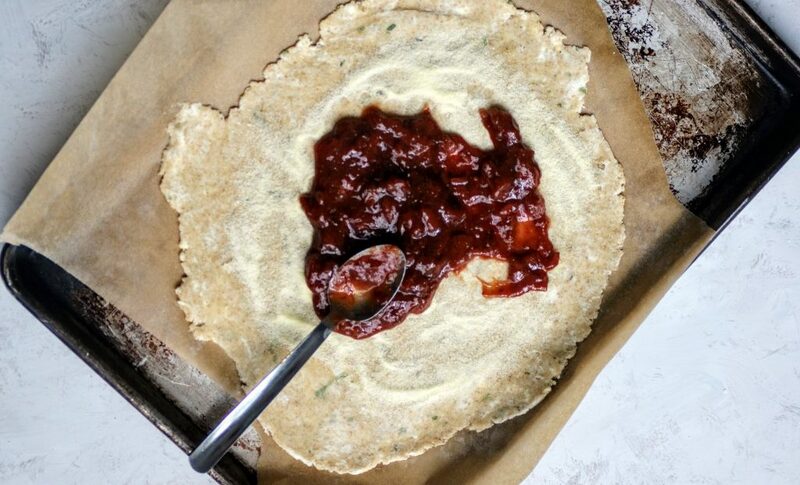 Strawberry rhubarb jam was used making this galette, any of your favorite jam works perfectly. Choosing local, fresh strawberries ensures the sweetest fruit. Raw coarse sugar is less sweet than granulated sugar and has notes of molasses and caramel, perfect for topping the fresh berries. A hint of rosemary salt on the crust gives the galette a perfect balanced sweet and salty component. In the bowl of a food processor, combine your flours, sugar and salt. Add in your cold butter pieces and pulse several times until crumbles form. Next, add in 4-5 tablespoons of ice cold water and pulse again. You may need another tablespoon or two. You want the mixture to form crumbles but not a sticky paste. Add in your chopped rosemary at the end. When the dough forms, dump onto a sheet of wax paper (it will still be crumbly). Form together and wrap and place in fridge to firm up for 30 minutes to an hour. 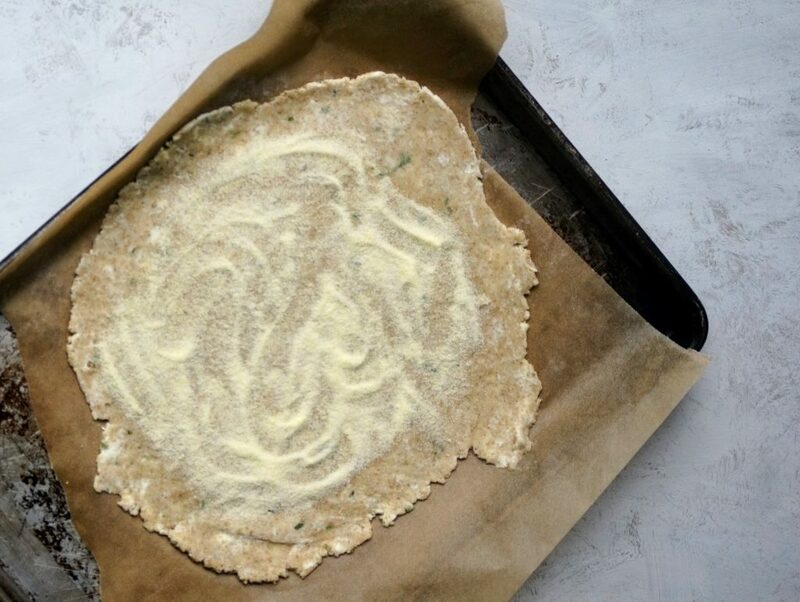 Begin by rolling out your prepared dough into a large circle, about 9-10" onto a sheet of parchment paper. 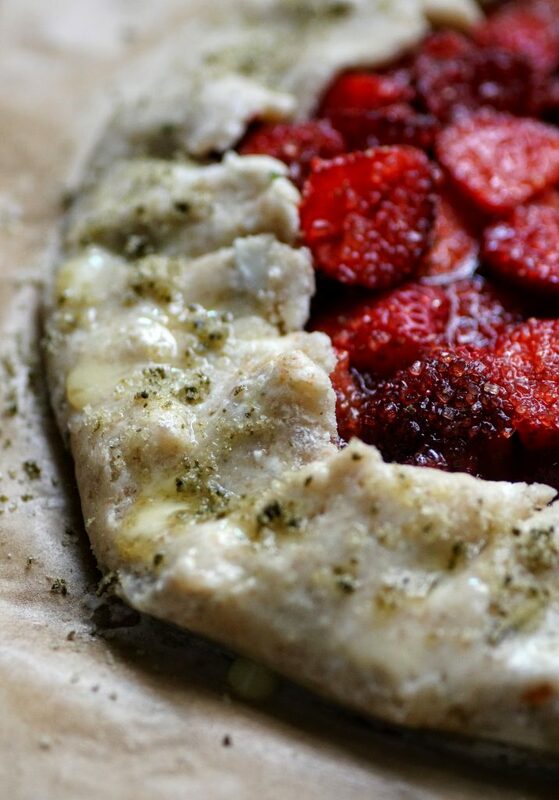 Place parchment with dough onto a sheet pan. Next, combine your semolina and sugar and spread evenly on the dough, leaving a border around the edges to fold. Spread your prepared jam on top of the semolina mixture. 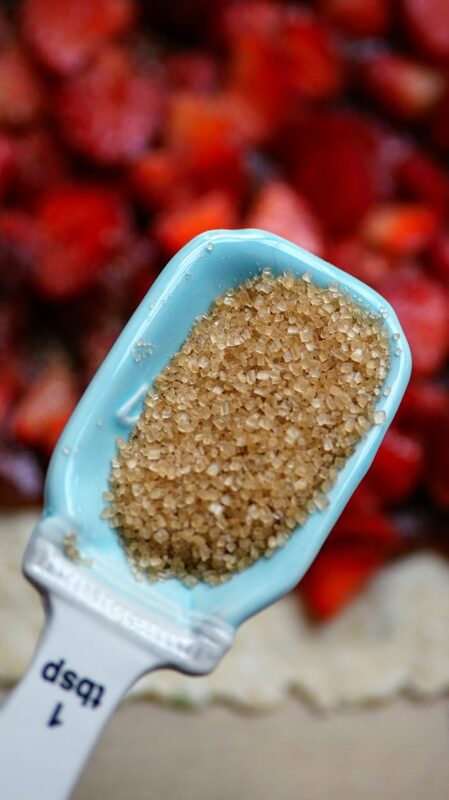 Next, place your sliced strawberries on top of the jam and sprinkle with your coarse sugar. Fold edges of the galette all around to form a crust. Brush the crust with an eggwash (1 egg + splash of water whisked). Finally, sprinkle the crust with your seasoned salt and bake on prepared baking sheet for 20-25 minutes until crust is golden and berries are soft and juicy. Remove from oven, sprinkle with additional chopped rosemary and let cool, slice and enjoy! **You may use prepared pie dough and chop rosemary and add in or use as is. **If you don't have spelt flour, continue by using all-purpose flour. Spelt flour gives more of a nutty flavor/taste but all-purpose works equally well.